I definitely don't want to forget what today is. At the same time, we are afforded the privilege of moving forward. 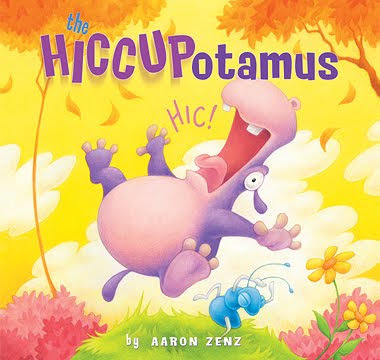 With that in mind, when I was contacted to participate in a blog tour for the re-release of Aaron Zenz's book The Hiccupotamus , I LEAPT at the chance. Not participate in promoting a book by one of my favorite children's blog facilitators? Why, there wasn't any question! For those of you who are still unaware of the blog Bookie Woogie, please go familiarize yourself with it. Author and illustrator Aaron Zenz talks and blogs about books with his three kids and it's a great deal of fun to read about. Furthermore, after they read and discuss each book, each of the kids (Lily, Gracie and Isaac) each produce their own illustration/version of the story for the delight and amusement of us blog readers. They have one of the most unique blogs I've ever seen and I encourage you to check them out! What I did not realize when I started reading their blog, was that the dad was an illustrator himself. (This explains the kid's talent.) Enter: The Hiccupotamus . This book arrived in our mailbox on the very afternoon following the very morning in which Bookworm1 had had the hiccups no less than four times. This book was very relevant, as you can see. Who hiccupped quite-a-lotamus . . ."
In fact, this hippopotamus cannot stop hiccuping and gets himself into lots of trouble with the other animals when his involuntary reaction to the hiccups cause a variety of accidents. Finally, relief is obtained on the part of the hiccopotomus but the other animals are not quite so lucky having succumbed to the terrors of hiccups themselves. Very cute book. It was very much enjoyed around our parts. Furthermore, the illustrations are very bright, cartoonish and feature our favorite animals (i.e., the rhinoceros and the elephant). This is a very silly book that is perfect for youngsters who like to twist their words to create silly sounds. Love Zenz's style and love this book (and neither of those loves have anything to do with love of the Bookie Woogie blog but I can't exactly say it wasn't prefaced with that! I was predisposed to like the book and glad that I actually did). If things couldn't get any cooler around here, Aaron is also offering two giveaway copies to one reader here at Reading to Know (one for you and one for a friend!) To win? Leave a comment below. U.S. Residents only, please. In the meantime, if you are looking for a silly good time, look for The Hiccupotamus . Fun stuff! But wait! That's not all! Want to learn more about the man holding the crayons? Check out his website which is one of the way-to-MUCH-more-interesting author/illustrator websites that I've seen. Aaron included stories that he wrote and illustrated in his younger days. I loved being able to see what he wrote and drew when he was a teenager. You can definitely see that the passion for creating stories was there early on. My favorite story? The Knight Before Christmas. Remember that journal that you kept in high school (and, if you were smart, probably destroyed)? He posted his journal online. Take a peek here. Have fun (and don't forget to leave a comment to win a copy of this book)! Also, if you just can't get enough of this, check out Aaron & Co.'s blog post in which Z-kids discuss their dad's book. THE CONTEST IS NOW CLOSED! The winner is #3 - Heidi Noel! I'll be popping you an e-mail shortly, Heidi. Looks like a very cute book. They have a great blog as well!! We've checked out that book from the library before and enjoyed it! I knew the book before I stumbled onto his blog. I love how he plays with rhyme and the softness of the illustrations. Their blog is fun, and this looks like a great book! sign me up! You were right with the tip about "The Knight Before Christmas." That is hilarious. I am looking forward to seeing Hiccupotamus. This book looks so cute! I can't wait to get my hands on it! Thanks for the great giveaway. Please enter me. The books is adorable. This book looks like so much fun! I think it would make my little boys just laugh! Wow! I did not know that he wrote the Howie series. Can't wait to read his latest creation! These would be cute! Count me in! This is such a cute book for kids. Please enter me. This book looks so cute- I enjoyed reading his blog post,too. Thanks for the heads up about this book. Maybe I can win a copy! Their blog is super fun and so is this book. Thanks for hosting a giveaway. We LOVE Mr. Zenz' books immensely. And his kiddos' reviews are perfect! We check them out before heading to the library. I think my son would really like this! I teach kindergarten. I know my kinder kids would love this book. This sounds like a wonderful book. My grandsons would love it. Thanks for the giveaway. What a cute book, thank you for posting about it and also for the entry to your giveaway. This is a really good book! Count me in! Amazed and honored. I rarely win anything. Books are the best!